When the Twin Towers fell, Welles's parents had no idea what happened to him. In the unbearable days that followed, they came to accept that he would never come home. But the mystery of his final hours persisted. Eight months after the attacks, however, Welles' mother read a news account from several survivors, badly hurt on the 78th floor of the South Tower, who said they and others had been led to safety by a stranger, carrying a woman on his back, down nearly twenty flights of stairs. After leading them down, the young man turned around. I'm going back up, was all he said. The survivors didn't know his name, but despite the smoke and panic, one of them remembered a single detail clearly: the man was wearing a red bandanna. 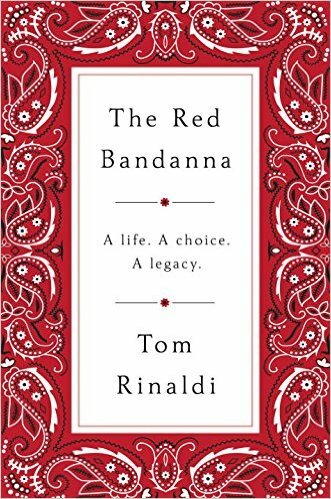 Tom Rinaldi's The Red Bandanna is about a fearless choice, about a crucible of terror and the indomitable spirit to answer it. Examining one decision in the gravest situation, it celebrates the difference one life can make. Can I just say I'm extremely happy that I'm sitting behind a computer right now, that way all of you can't see how ridiculous I look when I'm crying. This book was so emotional and real, guys. I really don't know how I'm going to do the review justice. Can you even "review" a book like this? I asked myself that question about a million times while reading The Red Bandanna. I most certainly will be recommending this one for years to come. How do you think you would react if you were in the world trade centers that day? We all wish, hope, and pray that we would have even half the courage that Welles demonstrated, but would we actually be able to do what he did? Guys, he didn't just help those he passed on the way down from the 104th floor. He went back to help more people and even carried some of them down the stairs. I could go on and on about the story told in this book, but I think a little time needs to be spent on what this book represents and what it has to offer. September 11th was a real day where real terrorists attacked our country, and it was a day where too many real people lost their lives. The Red Bandanna paints the picture of what that day really looked like. The reader is immediately transported into the Towers and sees what the victims saw. It is graphic and doesn't hold any details back, but I think that is what makes this book so incredible. Often, we see September 11th as "a terrible day in our history", or "a really scary day where a lot of people were killed". 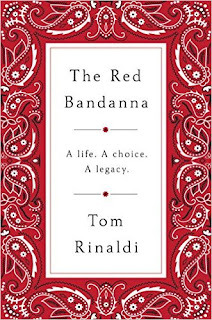 It is SO much more than that, and The Red Bandanna makes the day personal for you whether or not you live in New York and knew someone who died, or whether you live in a different country and don't really know what I'm talking about. There was so much sadness and horror surrounding that day in history, but The Red Bandanna spotlights the strong men and women that courageously saved lives, and it shows all of the good that came out of the day as well. There were so many lives lost, but there were so many lives saved as well. I honestly could go on and on about this book without doing it justice, which is probably what I've done. But please, please go pick this book up and give it a try. It is an incredible story written with beautiful style. The emotion is raw on the pages and I think it is an amazing story that needs to be read by the youth and adults of this country, as well as others. If you don't think this book is for you, please at least recommend it to someone who you think would enjoy it.